This page was updated May 11 2016 - this information is current!!! So, you are thinking of coming to the 14th Annual GCHR Picnic. Good, we welcome everyone - the more the merrier! 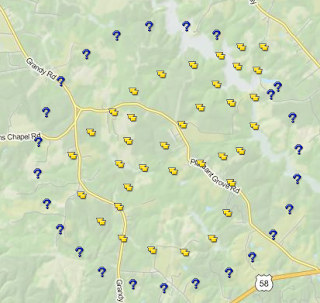 You want to know some of the best caches in the area to find while you are here. 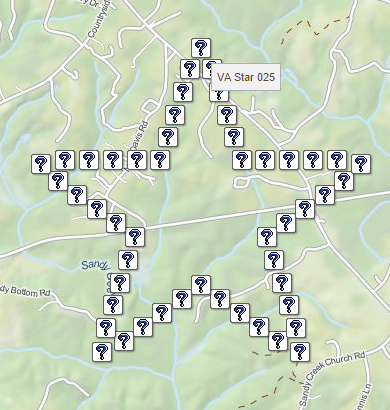 Today's we will cover the Geo-Art that is in our area as well as those in the state of Virginia. Star Trek Geo-Art, (GC5DK78) created and maintained by Kemallor. This geo-art contains 61 individual caches. This series can easily be accomplished in one day once you have all your answers and have mapped out the best route to take. Most of the caches are micro pre-forms and should be simple park n grabs. Please read the rules on each cache page but most of all - Have FUN! VTCC Geo-Art, (GC52E1Z) created and maintained by Kemallor. 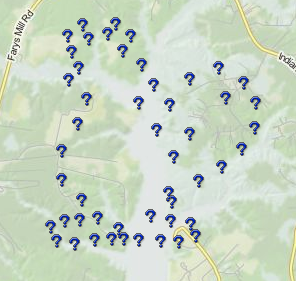 This geo-art contains 21 individual caches. This series can easily be accomplished in just a couple of hours once you have all your answers and have mapped out the best route to take. Most of the caches in this series are small home-made bison tubes. Have FUN! Just north of Gloucester is the Beaver Trail Geo-art surrounding Beaver Dam Lake, (GC50FDG) was created and maintained by the Rivahcntrygeocachers. This geo-art contains 50 individual caches a few of which are water caches. This series will take most if not all of one day to accomplish. Make sure you have all your answers and proper coordinates mapped out. It is suggested that you take two cars, park one at the rear entrance and then go back to the main entrance, park the other vehicle there and start your hike. There is a great variety of sizes and containers in this series. Have FUN! Note from SNAP!!! - use the 2 car method and bring plenty of water. Beautiful hike. SNAP!! !-land Geo-graffiti, (GC503GY) created and maintained by me - a.k.a. - - - SNAP!!! 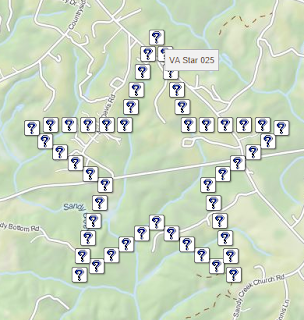 This geo-art contains 100 individual caches and is currently the largest Geo-art in Virginia. Once you have your answers and all the corrected coordinates, just do the series in numerical order and everything should work out fine. I have seen this series done in 4-5 hours but plan on 5-7. Please read the rules on each page. 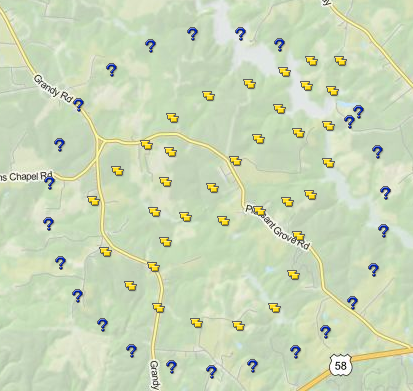 Most of the caches in this series are pre-forms. Have FUN! Note from SNAP!!! - kinda biased here as this is our series but can be done in 6 hours. Tobacco Heritage Trail, (GC568W2) created and maintained by ththider. 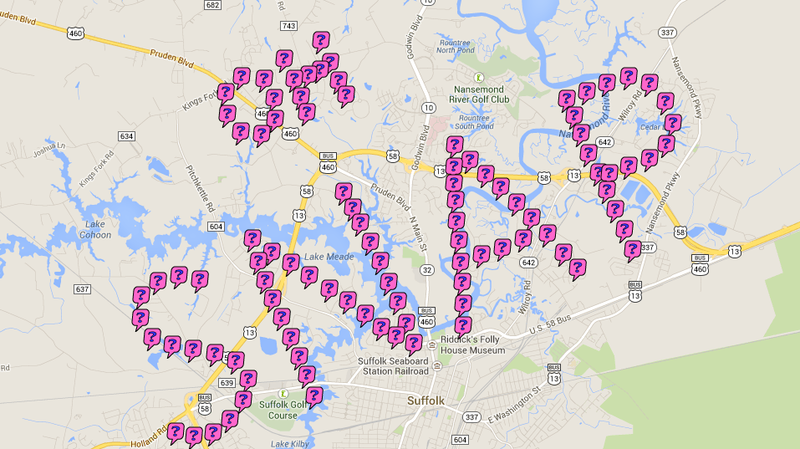 This geo-art contains 60 individual caches. This series is about 2.5 hours west of Hampton Roads or just East of I-85 in Brunswick county. There is a good variety of caches in this series and they are located along a very nice Rails-to-Trails hiking/biking trail. Along with the 60 caches in the series there are other caches along the way in addition to 5 bonus caches to go along with the series. Note from SNAP!!! - a 2 car method would work great here also. Lovely hike. Very nice variety of hides. Virginia Star, (GC5A6VA) created and maintained by Nocona 1. 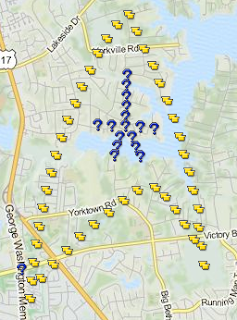 This geo-art contains 50 individual caches. 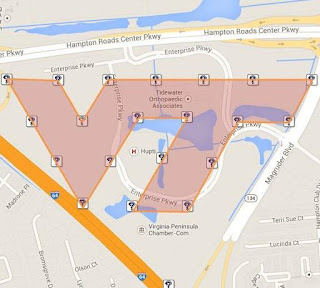 This series is about 3.5 - 4 hours west of Hampton Roads or just East of Danville, VA. This series is in rural Pittsylvania County on the Ringgold Rail Trail where the old Richmond & Danville Railway ran. You'll pass through wooded areas, through wetlands and over a five arch stone bridge, all on a 5.6 mile long, finely graveled walking/biking path. I can't really give you an estimate on how long it takes as this art is next on our to-do list! Note from SNAP!!! - As stated above, this is the only geo-art we have not done in Virginia but we here it is a great series and a very nice hike. I look forward to seeing all of you at the picnic. 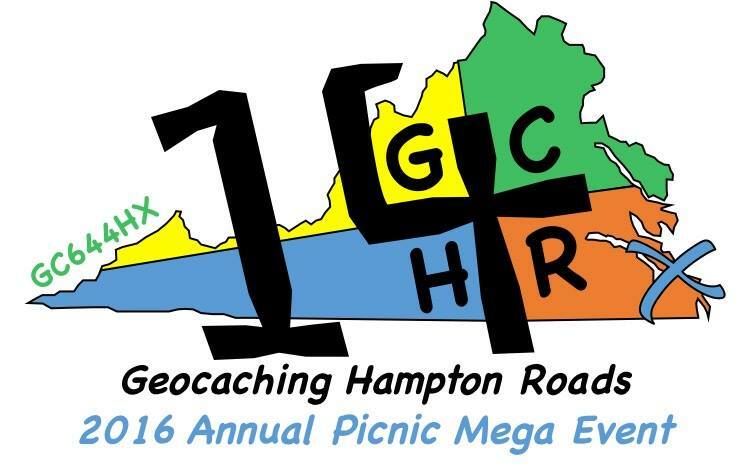 Please stop by my booth which will feature local geocaching information as well as handouts for GSAK. GSAK is a very nice program that lets you have numerous databases all in one program and has plenty of add-ons for all sorts of geocaching information.